Pregnancy Body Oil is a light oil with a fragrance of orange blossom and roses that feels soft on your skin, envelops you in a comfortable cocoon and increases the elasticity and firmness of your skin. Pregnancy Body Oil is suitable for use on your belly, bottom, legs and breasts. Almond oil, jojoba oil and wheat germ oil (rich in vitamin E) together with an extract of arnica improve the firmness of the skin, making it more elastic and easier to expand with your growing body during pregnancy. 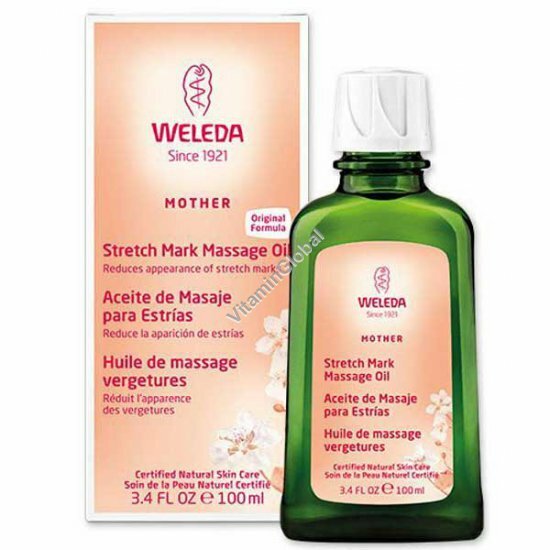 A dermatological center in tested the effects of Weleda Pregnancy Oil on stretch marks after childbirth. The women taking part in the study had given birth six months to two years previously and had stretch marks on their bellies, bottoms, breasts and/or thighs. Once or twice a day, they rubbed Pregnancy Oil into these areas, leaving a certain patch of the skin untouched so that it could be used for comparison purposes later. After six months, the treated areas had clearly reduced and the skin was visibly smoother than the skin that had not been treated. Usage: Warm a bit of the oil in your hand and then massage it into your belly, breasts, legs and bottom, using light circular movements, two to three times a day. You do not have to wait until you feel your baby kicking to start using the oil - as soon as you know that you are pregnant, applying Pregnancy Oil can be really beneficial for the contact between you and your baby. Regularly rubbing in the oil until up to three months after pregnancy can help reduce the chance of stretch marks and get your body back into shape. Especially for: pregnant women, from the early days of their pregnancy until up to three months after giving birth. Tip: During pregnancy, your breasts get fuller and more sensitive, feeling tight. It can therefore be soothing to rinse them with cold water after your bath or shower and then massage in Pregnancy Body Oil. By massaging your belly, you are also making contact with your baby. This helps give you confidence in the smooth progress of your pregnancy, childbirth and contact with your child after birth, enabling you to shed your worries and start enjoying your pregnancy and looking forward to the birth. By consciously focusing on your body, a belly massage can also help you to accept changes in your body and make you feel secure and confident in your own skin.